Fresh grass is preferable, but hay is a very good substitute and it’s available all year round. You can also buy kiln-dried grass. To keep things simple, we will use the term hay throughout this section to mean fresh grass, kiln-dried grass, or hay. What’s so good about hay? 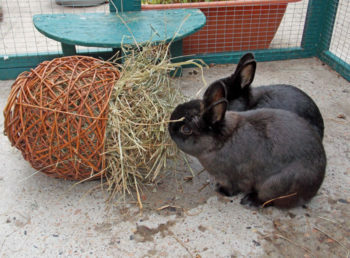 Unlimited, good quality hay is the foundation of a healthy diet for pet rabbits. As well as providing the nutrients they need, it has many other benefits, including keeping their teeth in order. Hay is quite coarse, even if it’s soft hay, and it’s covered in silicas. Microscopically it’s made up of a fibre called long fibre. This doesn’t have any relation to the length of the hay stalks, it means the size of the fibres, which are measured in hundredths of a millimetre. It needs to be chewed in a side to side motion and that is what wears down rabbit teeth. Unlike humans, rabbits’ teeth grow throughout their lives. The specific chewing action of eating grass and hay (plus the abrasive action of silica in the grass leaf) keeps their teeth worn naturally. This is vitally important: rabbits that don’t eat enough hay will develop painful ‘spurs’ on their teeth where the teeth have not worn down properly. These cut into your rabbit’s gums and tongue and restrict his ability to eat. Many pet rabbits die of starvation when this condition is left untreated. Hay provides lots of long-strand fibre which keeps your rabbit’s gut moving properly and teeth healthy. It’s the closest thing to a natural diet. Rabbits would naturally graze upon it all day, so ensure yours have an unlimited supply. What should I look for when buying hay? Bedding hay, and good feeding hay. Good quality hay should be dry, sweet smelling and free from grit, dust and mould. There is a wide variety available both on the high street and online. 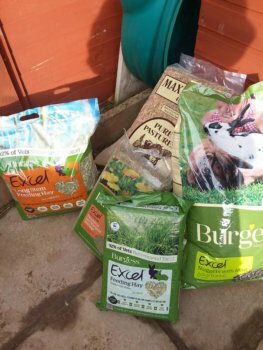 Buying in bulk is a good idea; try your local farm or riding stables for your basic supply to fill your rabbits’ ‘bedroom’ and litter tray, but you should add in speciality feeding hay. You can get these hays from pet shops and online. Adding them gives a variety of flavours and nutrients. Alfalfa hay is not a grass hay and it’s so rich it should only be fed as a treat. Kiln dried grass products can be used alongside hay and will provide different trace elements, which can be beneficial. So remember, you can’t give your buns too much hay! They will nest in it, play in it and nibble on it constantly. There are foods on the market that are called ‘complete’. These are not a replacement for hay. They can be considered like a nutritional supplement. Rabbits have evolved to use hay for their main food source, for dental exercise that comes from chewing grass or hay and to keep their digestive systems working well. We occasionally receive questions about contamination of hay and dried grass products with foreign material. Typically this is baler twine or similar inorganic material. If this is long or thick enough, it could cause an intestinal obstruction if eaten. However, rabbits may chew on, but rarely eat large amounts of such material. Another concern is organic material, meaning, sadly, parts of an animal carcass. This may be a wild rodent, bird, or even a rabbit, which has been caught up in the cutting and baling process. In most cases, such small animals, caught up at the height of dry weather, rapidly dry out and, dessicated like this, do not support bacterial growth or prove interesting to flies. Rabbit Viral Haemorrhagic Disease is, however, able to live on organic material for several months, and even dry pieces of a dead rabbit may harbour it. We would therefore suggest that if moist, foul smelling animal material is found in a bale, everything which has come into contact with that item (ie the hay all around it) is disposed of, along with it itself. This includes any wet, smelly or discoloured hay. If the hay is in a mixed up bag (ie initially baled, then packaged into smaller bags) there is more risk that disease is present throughout the hay, and this should all be disposed of, whereas in a bale, the potentially infected material is likely to be quite discrete. If any dried material is found, the risk is generally much lower, and either that material alone, or surrounding hay that has or may have contacted it, should be discarded. If the animal carcass is that of a rabbit, then it carries a particular risk to pet rabbit of carrying RVHD, and the whole bale or bag should be discarded oronly the visibly uncontaminated bits used for non-rabbit pets only.